B. Des. in Knitwear Design B. Des.is a 3-year undergraduate academic arts-centered program. It is much like a Bachelor of Fine Arts (BFA) degree, and many of the subjects are same across both courses. CEED (Common Entrance Examination for Design). The average tuition fee charged for the course in India ranges between INR 1 to 2 Lacs for a span of 3 years. Top Recruiting Organizations' Wipro, Infosys, Tata Steel, Aditya Birla Group, TISCO, SAIL, etc. Top Recruiting Areas' Manufacturing companies, pharmaceutical companies, automobile companies, food and beverage industries, and such. 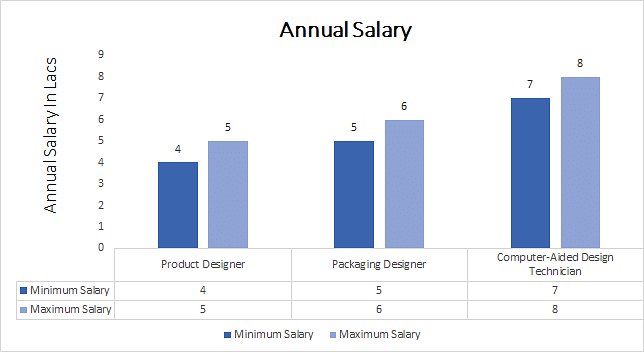 Top Job Profiles Product and Industrial Designer, Furniture Designer, Packaging Designer, Computer-Aided Designer, Medical Equipment Designer, among others. B. Des. in Product Design: What is it About? The course essentially involves an advanced study of products, systems, and their consumers. The program is user-centric, and processes information from daily life. It includes components from diverse domains like human factors, cognitive ergonomics, studio skills, advanced CAD, research methods, materials & manufacturing processes, design management, and social sciences. Within the course’s curriculum, emphasis is laid on development in eligible candidates, of a process-centric approach, directed at shaping the student’s creative skills. As part of the course’s curriculum, students participate in collaborative projects with industrial houses, social sector, government & private sectors, design projects, and a multitude of other such areas. A deep understanding of design principles and technology used. Understanding of clients’ needs, for tapping opportunities for innovation, imagination, and visualizing ideas solutions. Visual, creative, technical, and analytical skills. Knowledge of materials, products, technologies, manufacturing processes, trends, costing, and sustainability. At the end of each semester, enrolled students are needed to attend workshops, internships, and industry projects. Such candidates are taught to design a product that is user friendly, helps in executing daily tasks, and making them easy. Technicalities involved in product design. The designed product’s durability, its applications. Factors such as human factors, ergonomics, manufacturing processes, design management, material, and even social factors. B. Des. in Product Design: Who should opt? Good communication and interpersonal skills, for describing ideas to the clients. Creative imagination and self-motivation. Awareness of past and present styles of design. SRMJEEE (SRM Joint Engineering Entrance Examination). Product Design is fast-gaining significant relevance in recent times, whether it is consumer goods or industrial products. The major recruiters of Product Designers are goods manufacturing, automobile, telecom, and medical equipment firms. Product Designers draft briefs to create solutions for new products. The products that they create must be innovative, practical, suitable, and fit for manufacturing. Candidates with a good eye for detail and well-developed technical and creative skills are suited for such roles. Package Designers begin the design process, by meeting clients and developing an understanding and outlook of their packaging needs. They assess consumer tastes, research market trends, and finalize product details to bring package designs to life.